TARIK EDIZ, based in New York and Istanbul was founded in 1989 by its namesake Tarık Ediz himself. Started, as family jobs today become one of the leading brands in the sector of special occasion dresses. With the creativity of a designer, Tarik Ediz is offering exceptional dress and gown collections for women on their special days. Tarik Ediz Dresses 2019 are one of a kind evening gowns made with high quality fabrics and accessories. They consist of Tarik Ediz evening, bridal, and prom gowns and dresses, catering to a variety of styles, including elegant, classic, boho chic and modern. Tarik Ediz designs came from the deepest desires of every beautiful women, and they are mainly focused on highlighting feminine beauty to the best! The designs of Tarik Ediz are based on ravishing floor length dresses with super high slits, ‎one shoulder dresses that feature sheer tulle sleeves completely covered in ‎delicate crystal beading details, flower appliques that offer endless elegance or dazzling mermaid styles which is the best way to accentuate your ‎curves. This effectiveness is also achieved by adding other dramatic features like ‎cowl backs and open backs with a theatrical red bow on the back. The special evening dresses by Tarik Ediz impose an astonishing look on your stunning silhouette; while the designs, colors, and style of the dresses are, breathe taking enough. 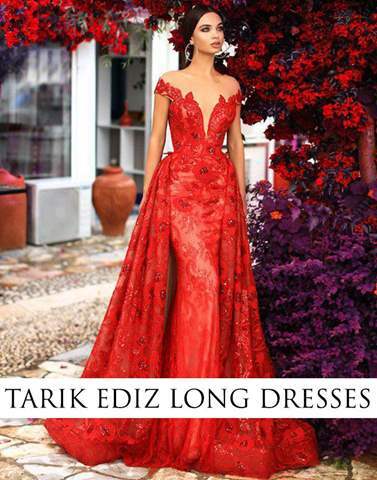 The evening dresses by Tarik Ediz are only here to celebrate the true nature of beauty, and elegance, making women around the globe feel this innate sense of being beautiful. These evening dresses are a selection of most wanted designs gathered by MackTak.com, only to pass along the joy, style, beauty, and to honor our amazing costumers. These dresses are one of a kind and they make you be unique and glorious. We sell Tarik Ediz Prom, Tarik Ediz Collection and Tarik Ediz Bridal. At MackTak we only sell authentic Tarik Ediz dresses with worldwide shipping.